For Alex and Fran, they move this Saturday into a bigger rented house, will let Fran be there as the wheelchair doesn't fit where they are renting. This is also in town so more of the friends will call in and see her. Her mum's is in a village and so takes more of a effort to go to. That's a fabulous card, Alison! 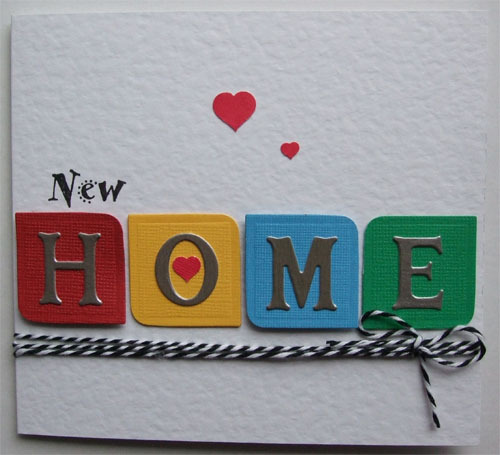 I always get stuck with what to put on a new home card, but this is a great idea. Scrap Monkey wrote: Oh I do like that! Words right out of my mouth. That's smashing, simple but very effective. Tis a good one, took ages to wake up the pic though, might blag this too, would be good for any 4 letter name or more on a rectangular card. Glad you all like it, and blag away Karelyn cos its my interpretation of one I found on google. So a blag already.